Situated near the beach, this motel is within 3 mi (5 km) of Batiquitos Lagoon Foundation Nature Center, Legoland California, and Flower Fields of Carlsbad. Carlsbad Premium Outlets is 2.2 mi (3.5 km) away. 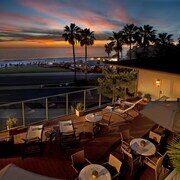 This all-suite hotel is just off I-5, a quarter-mile from Carlsbad State Beach, and 3 miles from Legoland. 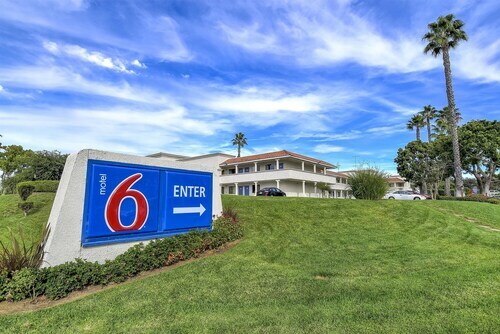 With easy access to Interstate 5, La Quinta Inn & Suites Carlsbad - Legoland Area is a mile from the beach, 2.5 miles from Legoland, and 4 miles from the antique shops at Carlsbad Village. 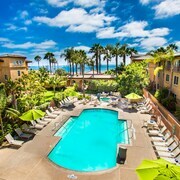 Situated by the ocean, this motel is within a 15-minute walk of Flower Fields of Carlsbad and Carlsbad Premium Outlets. Legoland California and Carlsbad State Beach are also within 3 mi (5 km). Guests at Carlsbad By the Sea Hotel can cross the street to shop at Barney’s New York and Calvin Klein, just 2 of the more than 90 stores at Carlsbad Premium Outlet Mall. Legoland® is 1 mile (0.6 km) from the hotel, and it’s a 7-minute drive to downtown Carlsbad. The Beach Terrace Inn is located directly on a private beach and is a 2-minute walk from laid-back shops, cool cafés, and summer outdoor movies in Carlsbad Village. The bustling Carlsbad Premium Outlets Village is a 9-minute drive with designer shops, while LEGOLAND® is 10 minutes by car. Situated in North San Diego County, this Carlsbad hotel is within 5 mi (8 km) of the beach and Legoland and 13 mi (21 km) from Camp Pendleton. The San Diego Zoo and SeaWorld are within 34 mi (55 km). Look out the window and watch McClellan-Palomar Airport (CLD) grow larger as the aircraft descends towards the exciting metropolis of San Diego County. Welcome to America’s Finest City! You'll be able to ride the moving sidewalks almost to your room when you book one of the 2 airport accommodations. The Homewood Suites Carlsbad North has everything you'll need, providing an assortment of amenities like 24-hour concierge. 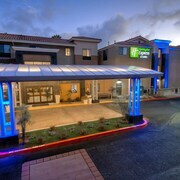 The Hampton Inn Carlsbad-North San Diego County, CA is also an excellent option. If you're after a convenient location to spend a night or two near McClellan-Palomar Airport, make a beeline for Lake San Marcos. 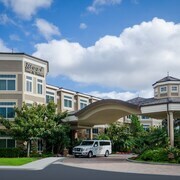 Sitting 4 miles (6 kilometers) away, this neighborhood offers a variety of accommodation solutions, such as the Residence Inn by Marriott San Diego North San Marcos and the Lakehouse Hotel and Resort. Even if you're waiting for your next flight, it's worth checking out Legoland California if you have time. It's located just 2 miles (3 kilometers) away. You'll have more time to enjoy your destination if you do all your planning first! Arrange your McClellan-Palomar Airport accommodation without delay and make those San Diego County dreams a reality. Breakfast was decent but crowded. The room was agood size but the carpets were dirty. Location was close to everything you need or want. And looks safe. North San Diego Luxury Family Summer Retreat - the Best Summer Trip Ever!